of Cambridge, September 6th. Loving wife of the late Mario Castillo. Beloved mother of Eleonora Mazariegos, her husband Stephen of Woburn, Carlos Gallardo, his wife Amanda Marie of NY, Eric Gomez of FL and Dora Gallardo, her husband Fredy Orellana of Somerville. Dear friend of Rosita, Candy and Maria Elena. Cherished grandmother of 13 and great-grandmother of 11. Loving sister of 3 bothers and 2 sisters. Arrangements are pending and will be announced at a later date. Romelia Gallardo, of Cambridge, died suddenly after being struck by a car on Thursday, September 6th. She was eighty- years of age. Born in Guatemala City, Guatemala, Romelia was the daughter of the late Maximiliano and Victoria (Gomez) Gallardo. Romelia dedicated her life to her family. She enjoyed spending time with them, listening to music and dancing. She was an excellent cook and no matter how she was feeling, would love to go on walks around her neighborhood everyday. She was a frequent player of bingo, dominos and occasionally, the lottery. Romelia will be remembered for her sense of fashion and love for her family. Although her death was tragic her family wants everyone to remember her for the bright smiling and selfless women she was. Romelia was an active member of the Boston Church of Christ in Arlington and will be deeply missed by all who knew her. Loving wife of the late Mario Castillo. 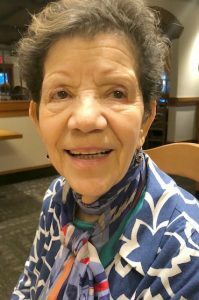 Beloved mother of Eleonora Mazariegos, her husband Stephen of Woburn, Carlos Gallardo, his wife Amanda Marie of NY, Eric Gomez of FL and Dora Gallardo, her husband Fredy Orellana of Somerville. Dear friend of Rosita, Candy and Maria Elena. Cherished grandmother of 13 and great-grandmother of 11. Loving sister of 3 brothers and 2 sisters. Abuela was very sweet, sassy, and stylish. I wish we’d had more time with her.